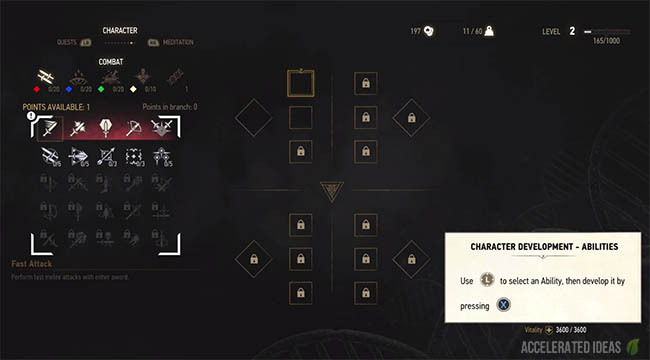 The Ability screen (or skill tree screen) is part of your characters development in the Witcher 3. From here you can unlock new Abilities and select a limited number to improve your characters overall rating in areas such as Combat, Alchemy, Signs etc. The skill tree in the Witcher 3 is more dynamic compared to other games, allowing you to swap in skills depending on the challenge ahead. The tradeoff is that there's a limit on the maximum number of active skills, no matter how many you've already unlocked. To open the Ability screen simply go to the in-game menu and select Character. The skills screen is split into 3 main areas with the left hand side showing you the various skills you can unlock and select, the middle area displays the traditional tree slots whilst the right side is reserved for hints and your character stats. The symmetrical tree which sits firmly in the middle is split into 4 sections. There are 3 stacks in each of the sections which gives you a total of 12 skill slots. This is the maximum number of skills (Abilities) that you can use at once. On either side of the 4 sections there is 1 slot reserved for Mutagens. Note: Skill slots need to be unlocked before you can use them and this is done by levelling your character. Before an Ability becomes active it must be placed on one of the empty slots on the Ability skill tree. An Ability which is not placed on the skill tree will not have any effect on your character. You can mix and match Abilities in the tree and also add and remove items during the game (when not in combat or danger). To unlock new Abilities you need to earn Skill Points. It's also worth noting that you cannot unlock every Ability in the game so choose wisely. There are 20 skills for Combat, Signs and Alchemy and 10 skills for General. There are also 4 tiers for every skill. 1 Skill Point for Levelling up your character, which is possible up to a maximum Level of 60. These mysterious items called Mutagens are able to radically transform or boost your character statistics when used in combination with Abilities. You will find Mutagems from looting dead bodies and also as by-products from Alchemy crafting, but in both cases the chance of finding them is rare. As with other items in the game, Mutagens are colour coded to relate to a particular area. For example, green Mutagens (e.g. the Noonwraith Mutagen) should be used together with Alchemy Abilities which are also green in colour. If you look at the image above you'll see that the green Mutagen is placed in the same group as an Alchemy Ability, thus granting a bonus of +300 Vitality. You can also stack more of the same coloured Abilities to increase the value of the bonus in this group by 100%. Mixing Abilities with the wrong Mutagen colour doesn't have a negative effect but it does limit the overall gain. Therefore try and group similar coloured Abilities together first. Of course everyone has their own preference for different build types. Some prefer an alchemy master, others a fearless combatant and some will go for Sign wizardry. The option to mix and match active abilities gives you that freedom. Combat: Whirl - probably the best skill in the game, Whirl allows Geralt to use Adrenaline points and Stamina to start a spinning attack that hits all opponents around him. Great for taking on several opponents at once (common in the Witcher 3) and also great when you're surrounded. 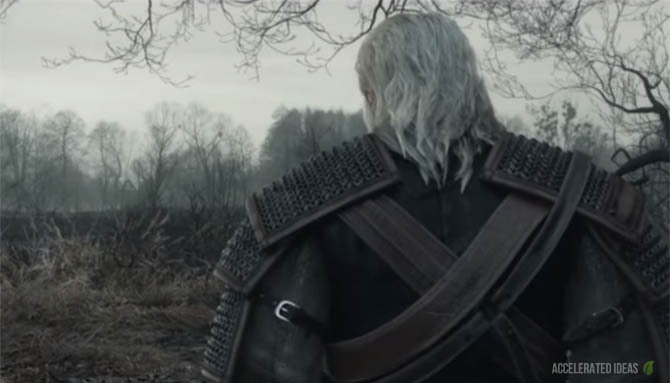 Combat: Razor Focus - one of the Battle Trance abilities which grants one Adrenaline Point before Geralt enters combat, and increases the amount of Adrenaline generated by sword blows. This is a great skill to combine with other Adrenaline hungry skills such as Whirl. Signs: Delusion - this skill is very useful during dialogue sequences to avoid wasting time or coins. 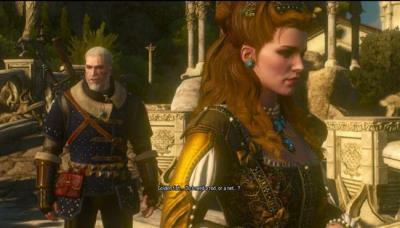 Spending three points on this skill will guarantee that Geralt gets his way if an Axii influence option is available during dialogue. Signs: Magic Trap - an alternate mode for the Yrden sign. Enemies are slowed by the Yrden trap, they also take damage and any projectiles passing through the Yrden field are destroyed. Signs: Melt Armor - an improvement to Igni that permanently weakens enemy armor. When fully upgraded this ability will reduce the enemy’s armor by 75%. Alchemy: Synergy - gives your mutagens a massive boost in effectiveness. If you’ve spaced your skill points evenly between alchemy and combat to unlock synergy, then you can effectively super power your melee attacks. General: Survival Instinct - not top of the list but boosts to Vitality will server you well during those long fights. Perform fast melee attacks with either sword. Muscle Memory (5 Levels) - fast attack damage increased. Whirl (5 Levels) - a spinning attack which strikes foes in the surrounding area. Perform stronger melee attacks which bypass armour. Strength Training (5 Levels) - Strong attack damage increased. Gain Wolf School defensive techniques. Arrow Deflection (3 Levels) - Deflect arrows while parrying and even deflect them back to the attacker. Counter Attack (3 Levels) - bonus damage from successful counter attacks and also chance of knockdown. Deadly precision (2 Levels) - each Adrenaline points increase the chance of killing the opponent instantly. Allows you to wield a light hand-held crossbow. Lightning Reflexes (3 Levels) - Time slows down while aiming the crossbow. Blows landed during combat generate Adrenaline Points. Each Adrenaline Point increases weapon damage by 10%. Resolve (5 Levels) - Adrenaline Point loss upon taking damage is lowered. Razor Focus (5 Levels) - gain Adrenaline points for entering combat and gain points faster during combat. Melt Armor (3 Levels) - damage dealt permanently weakens enemy armour. Firestream (3 Levels) - alternative Sign mode. Sign emits a continuous stream of fire. Sustained Glyphs (2 Levels) - increases Sign duration, number of mode changes and mode traps. Magic Trap (3 Levels) - alternative Sign mode. Traps and slows enemies, also destroys projectiles passing through the radius. Exploding Shield (3 Levels) - Quen shield pushes enemies back and deals damage when it breaks. Active Shield (3 Levels) - alternative Sign mode. Active shield no longer drains Stamina. Puppet (3 Levels) - alternative Sign mode. Targeted enemies briefly become allies and deal more damage. Heightened Tolerance (5 Levels) - Increase your overdose threshold and potion duration times. Poisoned Blades (5 Levels) - Apply oil to your blades and gain a chance to poison the target on each hit. Steady Aim (3 Levels) - Slow down time while aiming bombs. Acquired Tolerance (3 Levels) - Increase the maximum toxicity of Alchemy formulas. Frenzy (3 Levels) - Slow down an enemies attack depending on your Toxicity level. Regenerate Vitality and Stamina at a faster rate depending on certain conditions and the time of day. Increase your critical hit damage and fast attack damage from wearing Light Amour types. Each medium armour piece increases Sign intensity by 5% and Stamina regeneration by 5%. Every heavy armour piece you wear increases Vitality by 5% and strong attack by 5%. Crossbow bolts deal 25% damage. If Stamina level is too low, Signs can be cast using Adrenaline points. Increases Adrenaline generation by 5%. Using Signs generates Adrenaline points. Adrenaline points increase both weapon and Sign intensity. Increases maximum Toxicity by 30 points.